Discussion in 'Guitars in General' started by papersoul, Jul 12, 2008. I used to have a strat and sold it. I remember it played great and had a nice vibe but it wasn't my preference. I prefer Gibsons and PRS. Anyway, I have the itch now and am thikning instead looking at a fat strat so I can have my humbucking bridge. Anyone recommend this or is it better to stick to the standard strat and maybe use a small single coil sized humbucker instead? Big difference? What about the swimming pool route? Is that a big issue? Does G&L use the swimming pool route? Right now I have two Les Pauls, an SG and a PRS CE-22. I was looking for something different so a strat popped back in my head. Then I started thinking or G&Ls or other stratty guitars, but I always find a personal vibe with Fenders, just like I do with Gibson and PRS. 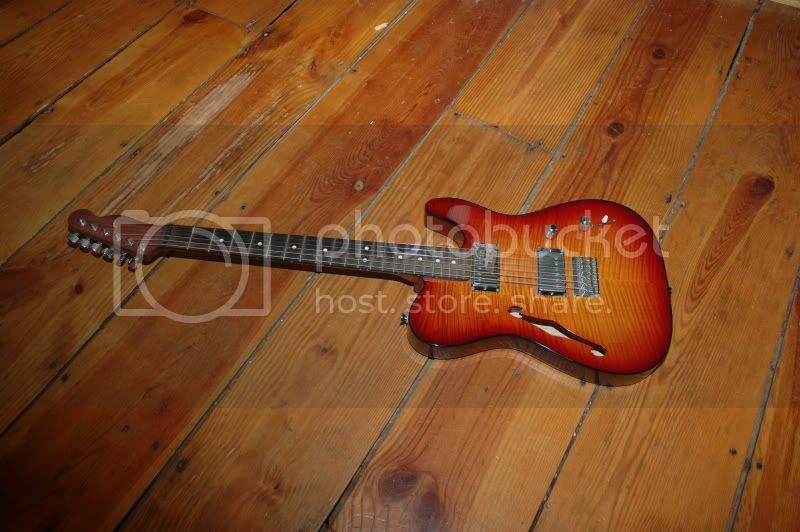 I even started lookin at Peavey Wolfgangs again and other guitars as I am always on the look out.....LOL. Then I was thiking I might want a better trem like a Floyd, etc. There are plenty of great sounding guitars with swimming pool route. Don Grosh Retro Classic, also Tyler guitars (not exactly swimming pool but pretty much it), both have a big hunk of wood removed. Anyone tells you that swimming pool route is bad is just full of it. There are just as many bad sounding guitars with traditional S/S/S as there are with swimming pool route. A strat with full size humbucker can sound great and can be very versaltile but it won't sound like a Les Paul, if that's what you want, get a Paul. You have to realize that the swimming pool rout vs HSS routing in a Strat is really a non-issue when you take into account the amount of wood taken out for the trem. My strat is very resonant and sustains as well as any other Strat I've heard. I like a hummer in the bridge but i split it for the quackage. The strat I had was s-s-s but I believe it had the swimming pool route and trem...and sounded great! I just want something different, I always play pauls. I'd go for a full bucker over a mini. I also like SSS strats. You might want to play a few before going the HSS route. 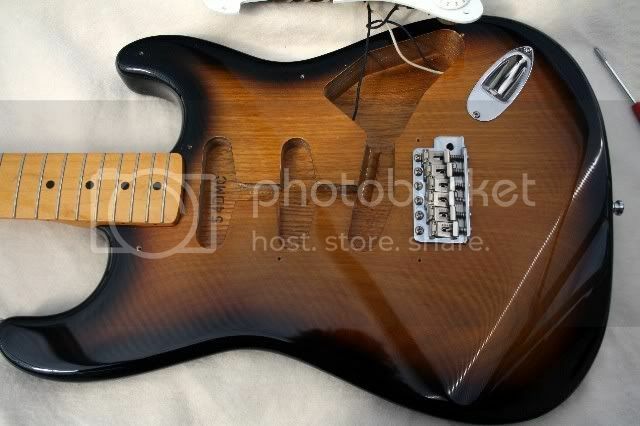 I was sure that I wanted a humbucker in the bridge before I bought my first Strat. After playing quite a few, I bought an SSS MIM Strat and now own three Strats all SSS. They haven't used a swimming pool route since the 90's. I did have an ash CIJ Strat for a while that was routed SSS, and a Seymour Duncan Lil '59 single coil configuration humbucker sounded great in that particular guitar. Melancon makes great Strat style guitars as well. Both SSS and HSS. 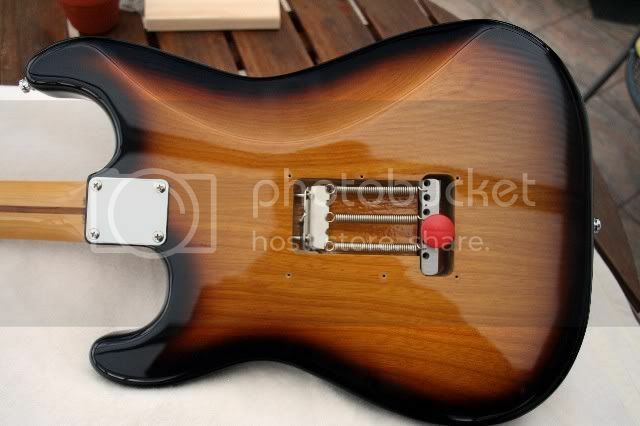 I had both pickguards for mine, easy to change back and forth. I think strats w/ a humbucker in the bridge are some of the most versatile guitars out there. Matching the volume output can be troublesome depending on the pickups. 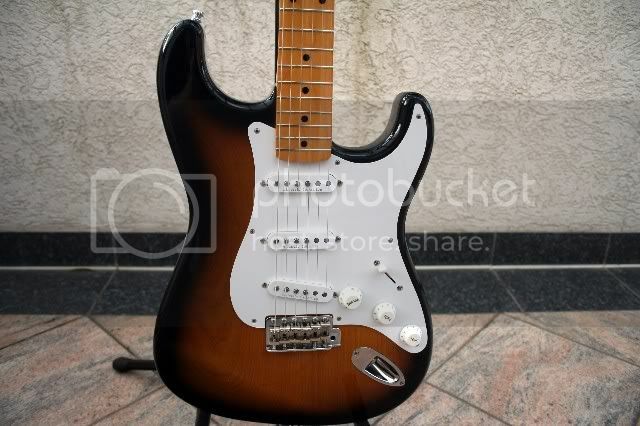 For me, having the strat bridge single coil is helpful if you play lots of clean stuff of course. I also have a peavey wolfgang that I am happy with. Feel free to message me or reply back w/ any specific questions about these. You can check out some of my gear at www.soultostrings.com/gear and see my notes about each one. Thanks bro! I like your site....nice music! Hey, since i have two LPs, an SG and a PRS CE-22 I want something different and the Strat or fat strat seems logical because I would have true single coil tones and something different. My CE-22 does phase and series single coil type tones with the 5 way switch....but sometimes I want that true Hendrix or Blackmore tone. I was thinking of a G&L or a Strat. I say G&L because sometimes I prefer a flatter radius board but I have some wrist problems and I think the lower radius fretboards can be easier for chording and easier on the wrist. I know the Wolfe is like a 14 or 15 degree radius! Fenders have a vibe too. When I play a good one, it is great! I played a few imported G&L Legacys and put em down. However, i can pick up a nice Mexican strat and still vibe on it if it is good. I had a black hard tail Wolfgang years ago and I think the flat fretboard got to me after a while and i also found it very bright and almost too aggressive at times. The PRS, Fender and Gibsons were more to my liking. I just vibe with Gibsons, PRS and Feners well. I hate to say that but it is true. I play heavier styles that you and I use an Egnater MOD 50 head and Ear Candy 212 cabinet. One thing that drove me nuts with a 2001 Strat I had was the lack of a beefy bridge tone since it was a s-s-s strat and the set screws dug into my palm so I thought a Floyd or other trem replacement might be good. Thanks for your kind words about my site & music PaperSoul. Much appreciated. You have some awesome guitars already, i am impressed. Sounds like if you could find the right axe with 3 single coils, it would fit your arsenal nicely. The reason I say that is because you have top of the line humbucker guitars already. I know what you mean about the wolfgang , those are so bright & heavy on output/gain. I've seen/heard some MIM strats that play amazingly. I'm all about taking a good playing affordable guitar & Making it more rockin w/ pickup upgrades. I know what you mean about three singles but I just never have a use for the bridge single much in my standard playing and that is why i thought a fat strat. 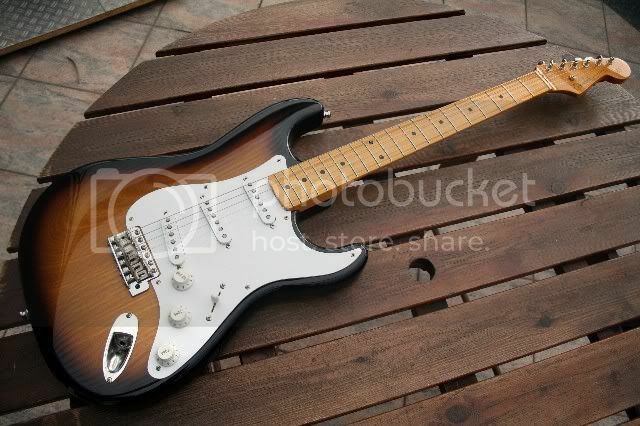 I guess you are thinking for a gig, having a strat and an LP would be cool because that would be very versatile! I could cover most things. However, it would be cool if I could just roll to a friend's jam sessionwith a fat strat so I could cver anything but my CE-22 covers a lot too. Ugh! Decisions. I've got 4 Strats and I still play them all, but for the last 7-8 years I've been assembling my main players myself. About the time I started making them, I noticed how comfortable one particular guitars was. I was playing a lot of jazz and I was using a Hofner guitar that had a 1.75" nut. I have pretty big hands and the wider neck seemed to suit my playing style more. 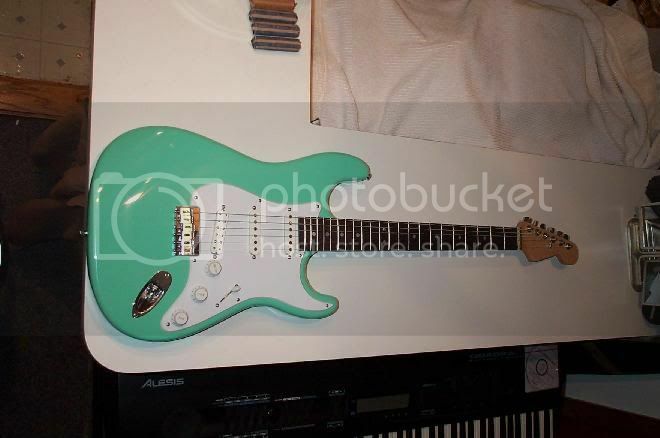 I started to look into some customs and ordered a Tom Anderson with a 1 11/16th wide nut. 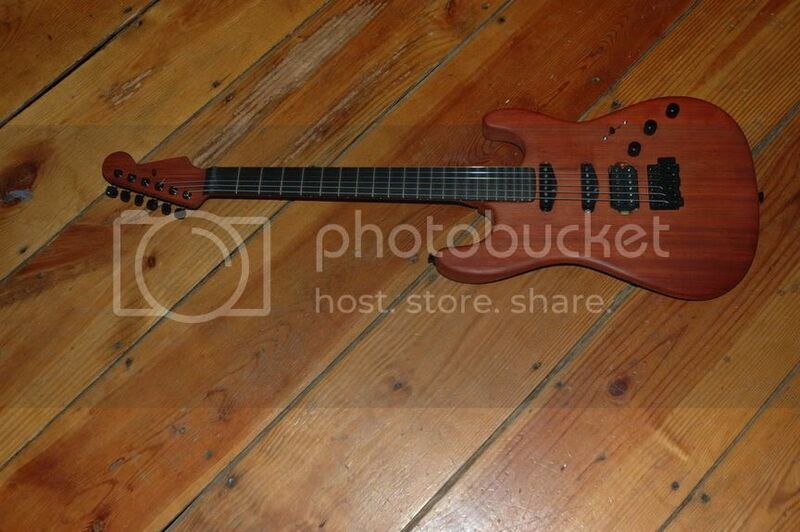 Real nice guitar, plays great and I still use it, but still not the ticket. I then noticed that the 1.75" size listed for the Hofner (I didn't know it was that wide when I first noticed I liked it) and it clicked. I have three Warmoths that all have 1.75" nut widths. They're shown in the order they were assembled. The first 2 have vintage-spaced hard-tail Strat bridges. They have a 2.25" spacing, a little wider than the modern models and the trem-equipped versions. The last one has a trem bridge with a 2.125" spacing. The last one closely resembles your description. It's got a full HB in the bridge, and the wood choices make it a pretty unique axe. It's a chambered Padouk body with a Padouk/Ebony neck. The pickups are DiMarzio ToneZone bridge, VV Heavy Blues middle and a VV Blues in the neck. I still like all my Fenders, but the bulk of my playing is now done on these. Thanks! Do any of these hve a special nut liike a graphtec or roller nut? I found a Fender but it has a roller nut and am afraid I won't be able to dial in the set up like with a plastic or bone nut where you can cut it down to get the set up and action correct. What about G&L and Carvin?????? Top quality? Yes, but if you play in a heavy band and like to go from clean single coil clean to heavy humbucking, that is tough. Maybe I should skip a strat for now, I don't know. How do the made in Japan strats compare? I played some nice Mex strats. Then, there are always the Carvin and G&L copies. Any thoughts on roller nuts?